“I saw a beast coming out of the sea. which is the number of the beast. When you expect a kind of “The Exorcist” variant with a person possessed by a demon, ranting and raving while being chained to a bed, vomiting green slime, reciting incoherent fragments of text in a foreign language that he/she doesn’t master and spinning his/her head around in a supernatural way, then you’re wasting your time with “At the Devil’s door“, because this is not that type of film. But if you are a lover of the more subtle horror genre with a nasty undertone and a sinister, menacing atmosphere created by the use of shadows, moving objects and a constant palpable threat, then this is a must see. Of course there will be grumbling about the lack of depth of the characters and of real scares. Firstly, I think a horror isn’t always successful by using irritating artificial frights (as in “The Quiet Ones” where they used deafening sound effects) or by excessive use of gore elements. To me a horror is brilliant when, even if these elements are applied to the minimum, and it still has a nasty and devilish atmosphere. And you don’t need profundity to create that. I suggest you watch a shakespearean drama when you’re into that. You also don’t expect scary moments while watching a romcom. It all starts with a teenage girl called Hannah (Ashley Rickards) who makes the mistake to accept the invitation of her boyfriend to play an innocent game and as a reward gets 500 $ for doing that. In a ramshackle caravan somewhere in the middle of a desert, an eccentric, horrid guy plays a cup game with her and comes to the conclusion that she is “chosen” and she should go to a particular intersection and speak out her name so that “he” will know her when the time is right to call her … Years later we meet the real estate agent Leigh (Catalina Sandino Moreno) who’s going to sell an abandoned house which later appears to have been the parental home of Hannah. Together with her sister Vera (Naya Rivera), she is sucked into a demonic game where evil is trying to nest in human society. 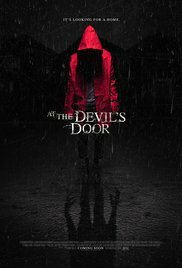 “At the devil’s door” basically covers the same theme as told in Goethe’s work “Faust” : the closing of a pact with the devil and giving your soul in exchange. In this case it’s not really voluntary, but it’s kind of the same idea. The scene in Hannah’s bedroom suggests that it will turn out to be a typical horror about possession and that an accumulation of clichés will be the result. Nothing could be further from the truth. The story very slowly unravels a sinister plot while using the principle of “less is more”. This paranormal horror, in which a mix of “The Exorcist” and “Rosemary’s Baby” is interwoven with a little family drama, makes sure you haven’t got a clue where it’s leading too. In addition, there are some surprising twists in the story which sufficiently compensates the lack of some decent frights. There are some extremely strong fragments in it. Like Hannah’s bedroom scene, the “Little Red Riding Hood” type of girl who turns a babysitters night into a hysterical experience for the concerned parents, Leigh’s confrontation with evil and the ultrasound (“The Possession” flashed through my head for a second). Simple and unspectacular portrayed. Subtle and exciting at the same time. The two main players Catalina Sandino Moreno and Naya Rivera are two outstanding actresses and beautiful at the same time. For once they aren’t like most girls in a horror film, running around screeching and being slaughtered by some demonic power. They are intelligent go-getters who defend themselves. They both have a very different role in this film and divide the whole into two additional episodes. And the little girl Ava Acres who played “the girl” at the end, had such a minimal role but played it in such terrifying way. Most will call the end weak and disappointing. Personally I thought it fitted the entire movie and made it pretty open-ended so a sequel isn’t unthinkable. All praise to Nicholas McCarthy who tried to create some new animo in the horror genre.